1. Snap It Snap a photo showing you creatively wishing President Obama a "happy birthday" in time for his 48th birthday on August 4th. 2. Post It Update your profile picture to that photo and add a caption. 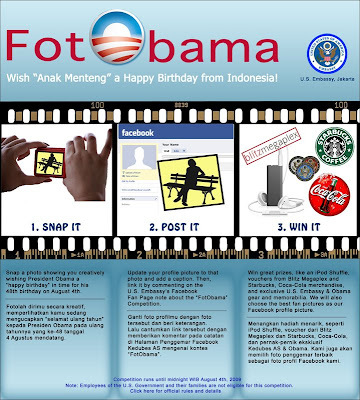 Then, link it by commenting on the U.S. Embassy’s Facebook Fan Page note about the "FotObama" Competition. 3. Win It Win great prizes, like an iPod Shuffle, vouchers from Blitz Megaplex and Starbucks, Coca-Cola merchandise, and exclusive U.S. Embassy & Obama gear and memorabilia. We will also choose the best fan pictures as our Facebook profile picture. A new survey by the Pew Research Center's Global Attitudes Project, conducted May 18 to June 16, finds signs of improvement in views of America in some predominantly Muslim countries that held overwhelmingly negative views of the United States in the Bush years. The most notable increase occurred in Indonesia, where people are well aware of Obama's family ties to the country and where favorable ratings of the U.S. nearly doubled this year from 37% in 2008 to 63% in 2009. Read the full report including interactive graphics at pewglobal.org.